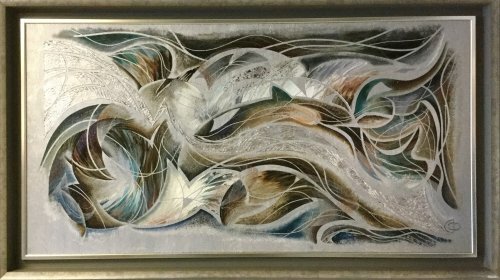 Abstract painting ion a textured silver metal panel in a striking double frame, creating a spectacular finish to already stunning piece. Neutral colours are offset by teal and silver with hints of bronze colours warming up the overall colour scheme. It can be displaced landscape or portrait.